The S.I. Newhouse School of Public Communications is launching a new course, “The Sports Media Project,” in partnership with FOX Sports University. The three-credit course, open to juniors and seniors in any major, is co-taught by Ed Russell, associate professor of advertising, and John Nicholson, professor of practice in broadcast and digital journalism and director of the Newhouse Sports Media Center. Twenty-four students from four Newhouse departments, as well as sport management students from the Falk College, have enrolled in the course. “Working with the people from FOX Sports University is a great opportunity for our students and for us as faculty. We’re ‘champing’ at the bit to get started,” says Nicholson. Students will work together in teams to compete in a challenge set by FOX Sports University. They will have access to FOX Sports data and guidance from FOX Sports executives as they work on their projects. Some projects may be produced by FOX Sports. 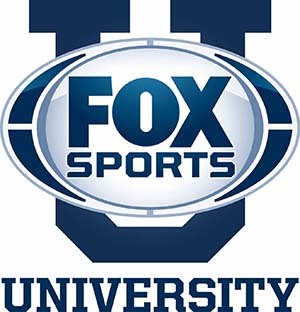 FOX Sports University, founded nine years ago, is the largest, most comprehensive program in the country intent on bridging the gap between academia and the sports industry. Together with 38 acclaimed university partners, the FOX Sports University program provides unique and enriching educational opportunities to students from coast-to-coast. The goal of FOX Sports University is to bring the real world into the classroom, giving students valuable experience and a head start when entering the job market. Students work in teams and present their insights and recommendations back to FOX Sports executives. Winning ideas may be brought to life, giving students the opportunity to observe what it takes to make an idea come to fruition. FOX Sports U Campaigns have earned impressive recognition, including Emmy, Telly, Addy, Golden Matrix and Promax Awards. For more information, visit http://www.foxsports.com/presspass/latestnews/pov/fox-sports-u–bringing-the-real-world-into-the-classroom.